First peel and cut the bananas in half at the middle of each one to form 8 small ‘pops.’ Then insert one popsicle stick into the base of each banana half. Separately, line a tray or dish with wax paper and place the pops on top. Freeze for 30 minutes. Meanwhile prepare the banana toppings; place the chopped nuts, flavored sprinkles and or shaved coconut in separate dishes, ready for dipping. Then in a medium-sized bowl, combine the chopped Mexican chocolate, chocolate chips and cream. Place the bowl over over a bain marie or water bath on low heat until the ingredients are completely melted. Remove from heat and mix well. Next, remove the bananas from the freezer and coat each one completely in melted chocolate. Then dip in your favorite toppings before returning each pop to the wax paper. Freeze for at least two hours before serving. ¡Disfrute! You can use other toppings of your choosing. 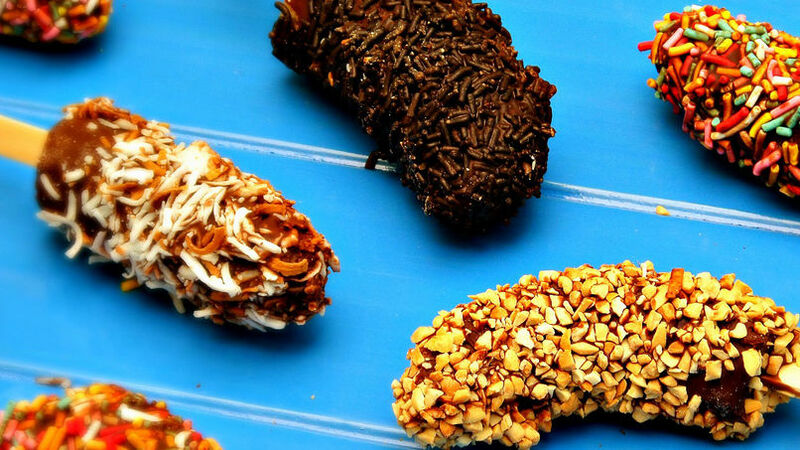 Frozen bananas dipped in chocolate delight both children and adults. It’s also an easy treat to prepare for a hot summer’s day. Mexican chocolate, used for dipping the bananas, contains cinnamon, sugar and ground almonds. This light toque of cinnamon combines with the bananas to create a flavor that hooks anyone who tries this dessert.